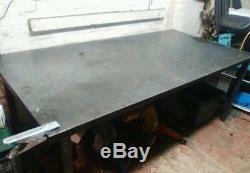 This listing is for a 1000mm x 1000mm table as pictured. Will come at a base height of 750mm unless requested otherwise. Made from heavy duty 50mm box section welded frame with a one piece mild steel 5mm thick top makes it perfect for welding and fabrication but also for heavy duty work like engine building. Due to the whole table been welded you can just attach an earth clamp from your welder to any of the 4 corners of the table and any metal work piece on table will be earth ready to weld which makes life a lot easier. They come with 4 large adjustable feet rated to 1000kg giving up to 85mm height adjustment. Castors can be added at extra cost. They come unpainted but can be powder coated for a extra charge. Can be made to any size or even different shapes message me or call me if you need a set size. The item "Welding table 1000x1000mm 3.2x3.2 foot heavy duty packing work" is in sale since Sunday, October 8, 2017. This item is in the category "Business, Office & Industrial\Metalworking/Milling/Welding\Welding & Soldering\Welding\Other Welding Equipment". The seller is "mbiker753" and is located in Birmingham. This item can be shipped to United Kingdom.